This 1,300 pound capacity truck turns conveniently on (2) 8" Poly-on-Steel center wheels and is stabilized by (4) 4" poly swivel casters. 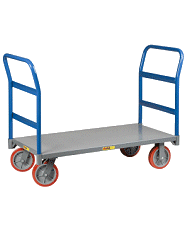 The combined (6) caster design and narrow platform allows the operator to maneuver through doorways and aisles. Ideal for transporting and stocking small packages in warehouses, shopping malls, grocery stores, post offices and schools. Steel platform construction with steel uprights. Diamond plated deck to help prevent slipping of items. Powder coat finish.